Howdy-ho, lovelies! Happy Monday and a very happy August 31 to ya! Please, can someone tell me where in the world the summer went?! I can’t believe we’ll be greeting September tomorrow. I moved into a brand new apartment. With my boyfriend. I visited with family and friends. I ate at some incredible restaurants. I started my first “big-girl” job. I went to Chicago. And Atlanta. I drank beer around a campfire. I took long walks around the city. I drank some incredible tea at various hipster coffee shops. I went to the beach with family. I created some mouth-wateringly delicious recipes. I posted some kitchen how-tos (and created my very first blogger video!). I wrote a How to Run a Food Blog post. TL;DR: It was a perfect summer. While I’m sad to kiss all that freedom, fun, and beautiful summer produce goodbye, I’m welcoming fall with open arms. All hail the season of boots and scarves! I love this time of year. Back-to-school, cooler weather, cinnamon, apples, pumpkin…fall makes my heart sing. But because summer has been such a faithful companion, let’s see it off with a bang; consider this Fruit and Chia Bowl as summer’s going-away present. 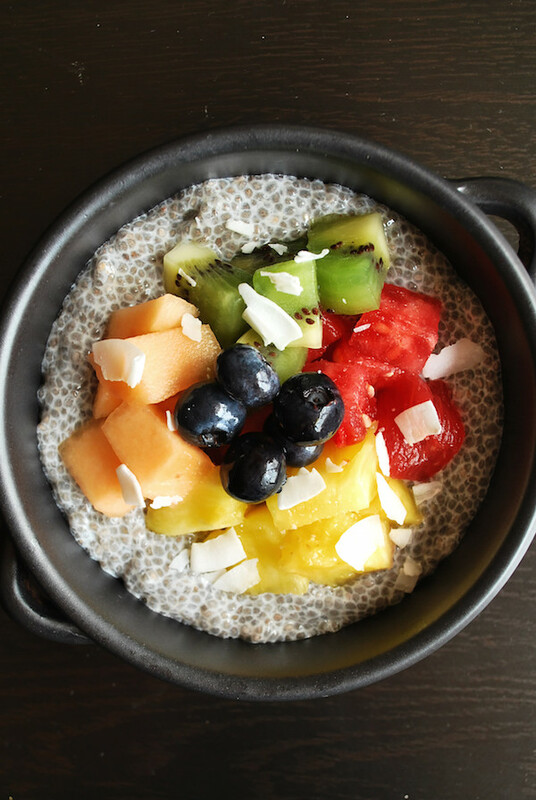 Enjoyed as a light dessert, a nutrient-dense breakfast, or a fresh mid-day snack, this Fruit and Chia Bowl will help you savor these last few beautiful moments of your beloved summertime. 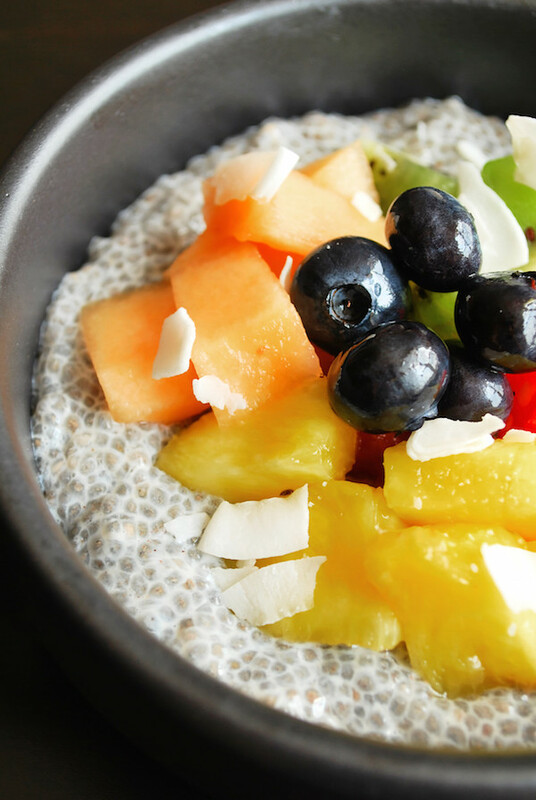 I am a self-confessed chia seed freak. 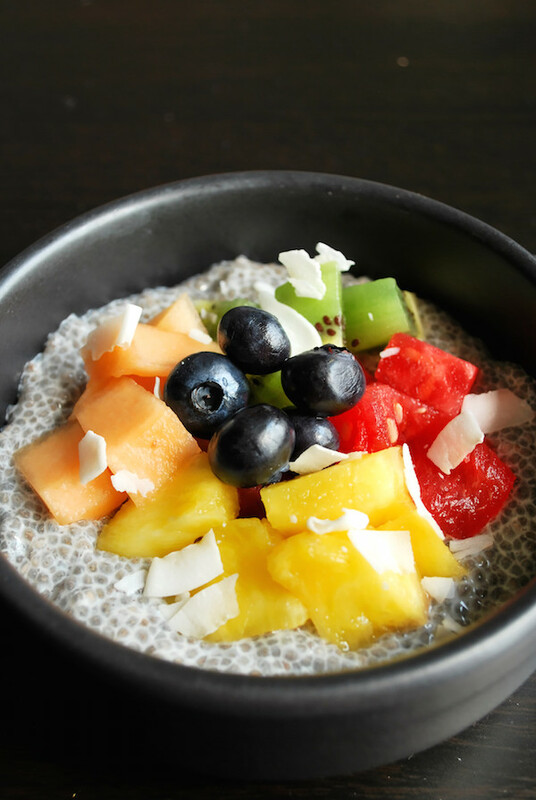 Not only do they give an impressive amount of protein (6 grams) and fiber (10 grams) to this Fruit and Chia Bowl, they add such a unique and fun texture to it, too! Now, I’m fully aware that it takes a special kind of person to enjoy chia’s tapioca-esque texture. If you’re one who’s a little freaked over their beady texture, feel free to give the pudding a whirl in your blender; you’ll be left with a fluffy, pudding-like mixture with no seeds in sight! Summer offers the best selection of fresh fruits, so feel free to get creative with your Fruit and Chia Bowl! I opted for some of my favorites: kiwi, pineapple, watermelon, cantaloupe, and blueberries. If I were a bettin’ girl, I’d bet that a berry-topped bowl (strawberries, raspberries, blackberries) would be divine. Pro tip: buy one of those pre-cut “mixed fruit” containers at the grocery store to get a large variety of in-season fruits. That way, you won’t have a ton of random fruits laying around your house! For an additional summer flair, let’s top our bowls with some coconut. You can even take it one step further and toast it in the microwave. Mindblowingly good. Use this Fruit and Chia Bowl as an ode to your summertime fun. Those long nights, those delicious picnics, those perfect sunsets… You’ve certainly served us well, summer. Combine almond milk, chia seeds, cinnamon, and optional sweetener in a small bowl. Mix to combine, and set in the fridge to set for 2+ hours. Check back about 10 minutes after you place it in the fridge to give your mixture one more stir to break up any chia chunks that may form. After the chia seed mixture is set*, cut fruit into bite-sized chunks. Place it on top of the chia seed mixture, and top with flaked coconut. *If you’re not akin to chia pudding’s distinct texture, feel free to blend it until smooth. You’ll end up with a fluffy, pudding-like texture instead of one more similar to tapioca. This is one of my favourite breakfasts! I had something similar this morning! I do like to blend it though as I prefer the smoother texture. Oh isn’t it good?! I love how light and refreshing, yet totally fulling, this breakfast can be!